Earthquakes happen along geological fault lines where one section of earth crust is being pushed under another one. When the weight of the upper plate becomes too great, the pressure is released quickly rather than slowly and a tremor ensues. The amplitude of the quake depends on how much pressure has been built up prior to the release. Lots of pressure can cause truly calamitous events with unimaginable death and destruction. Politics are no different; in truth, the upper classes, the elites are always pushing down those less fortunate. They climb up by pushing others down. It is simply the human condition. In well-balanced societies, an arrangement exists that makes certain adjustments, provides certain compensation to the less fortunate. This was the case in America when it was still governed by its Constitution, from the end of the 18th century to the beginning of the 20th. The Constitution denied the elites the tools to oppress their less affluent and less powerful countrymen. They could not deny them the right to speak freely, to assemble, to own and bear arms of any kind, and placed severe limits on the financial controls that the elites could exercise against the population at large. This created, at least for a while, a stable system in which, while upward mobility was possible, even those who could not take advantage of it could live happy and fulfilling lives free of tyranny and oppression. Alas, arrangements such as this are a rarity in history, the exception rather than the rule and the American experiment with Constitutional limited government was not to last. For the past century, America has been modifying its Constitution, occasionally as intended by Constitutional amendment, but much more frequently using the undemocratic and unconstitutional instrument of judicial interpretation. Taken as a whole, this century of constitutional drift has had one direction and one direction only: away from the individual and to the government, away from state government and to federal government, away from the elected branches of government, the legislative and the executive, to those appointed with lifetime tenure: the judiciary and the bureaucracy. Elected government is populated by the elites, of course, but once in a while a member of the regular public may get elected, or, more likely, a member of the elites may get elected promising to implement the agenda of the regular folks and in rare instances this person may even try to keep his promises. In contrast, the judiciary and the bureaucracy, by their very nature, are closed to members of the regular public and are staffed entirely by elitists. As these institutions gain more and more power at the expense of regular citizens, they attract more and more support from big business, which has little incentive to deal with the general public or the powerless elected branches. This creates an unstable, diverging system in which power drains at an accelerating rate away from the base of the social pyramid and into its top. Not surprisingly, as the general populace is drained of power and resources, as its ability to affect its own fate is progressively taken away, dissatisfaction grows. The elites, not oblivious to this, engage in ever more heavy-handed propaganda campaigns, utilizing for this purpose the purportedly “private”, though in reality state-controlled or state-controlling Big Business. America today is reaching the epitome of this phenomenon with nearly all of the massive government-business apparatus engaged primarily in churning out government propaganda and attempting to censor not only what people say or do publicly, but also privately, including in the privacy of their bedrooms and bathrooms. The mass disinformation, propaganda, and censorship campaign taking place in America today is without equal and without historical precedent. Never before, not in Nazi Germany, not in Stalin’s USSR, not in Pol Pot’s Cambodia or Chairman Mao’s China has there been a more concerted and more successful effort to disinform the public and take away its freedom of expression in both public and private forums. This is not to say that the American elites are more highly motivated to control their citizenry than their equally odious predecessors, no, they simply have access to much better technology, a set of tools that were ostensibly funded and developed by private companies in response to market demand, but in reality were carefully hatched by government elites using the multitudes of programs via which the American government routinely chooses which technology will be funded and developed and which will never see the light of day. Regular Americans are finding themselves today in a world in which they do not know whom to believe, are constantly looking over their shoulder to see if there is anyone out there who can overhear them, read twice every social media post to make sure that it will not get them banned from their platform of choice which they may also use to check when the next hockey practice is taking place, and dread the day when they will have to fill out the next application for a job, a college, or a loan, because there they will have to check the little square box next to the dreaded word “white”, a check that will disadvantage them from getting whatever it is that they were applying for in the first place. Any complaint is, of course, unthinkable, because it carries with it the penalty of being branded a “racist” or worse, a “white nationalist”, labels that are paramount to excommunication and internal exile. No society can long endure this kind of pressure; as it is building, so are the chances of explosive relief, a truly cataclysmic event considering America’s size and the amount of firearms that exist in it in both private and government hands. The Bible is, of course the mirror to the entire human condition and Bible teaches us that truth tellers come from the unlikeliest of places. Moses had a speech impediment, yet God gave him the job of speaking for all of Israel. David had no military training and yet it fell to him to slay Goliath. Gandhi was a self-taught lawyer from India’s lower middle classes, but he was the only one who could help India avoid bloodshed of tens of millions, though the price of one million dead during Partition was high enough. Well, history may yet repeat itself, because America may have gotten its Moses, its David, its Gandhi, and it is as unlikely a personage as any of them. 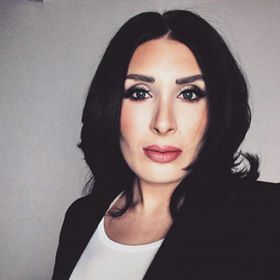 Laura Loomer is a young American Jewish woman, who is utterly unremarkable in any way. I do not know her (though I hope to meet her someday), but from what I can tell, there was nothing in her life that would prepare her for the role she is playing and will yet play in America. She seems to simply be possessed of the one character trait that is common to Moses and David and Gandhi: great personal courage. I honestly don’t know what takes more guts: stand in the presence of God in the burning bush, face Goliath with nothing but a sling, stand up to British colonial authorities, or run up on the stage of that ridiculous production of Hamlet in Central Park, as much a travesty against Shakespeare and good taste as it was a diatribe against a duly elected president. tThe consequences faced by Laura for her actions are in many ways worse than death. Yes, God could smite Moses down for disobeying Him. David could have been cut in half by a mighty swing of Goliath’s sword and Gandhi was both exiled and imprisoned by the British colonial authorities. And yet not one of them suffered or was likely to suffer the character assassination, the sheer vile hate, the ridicule, and the very real actions by huge corporations like Twitter and Face Book to deprive them of any means of making a living that Laura is exposed to every single day. For telling the truth: that the so-called Women’s March is rabidly anti-Semitic, not to say Nazi, that the Hamlet production was hateful propaganda and not art, that Nancy Pelosi and her ilk have raised hypocrisy to new heights by hiding behind walls while leaving regular Americans exposed to every danger, Laura is putting her life in real danger, making herself unemployable by pretty much everyone, because no one in the so-called conservative movement has one percent of her courage, and exposes herself to every libel that can be invented by the faithful lapdogs of the American elites. Unlike the globalist lackeys Antifa and Black Lives Matter, unlike the recluse Jew haters who like to murder innocents in their houses of worship, unlike the brainwashed halfwits who shoot up and try to murder Republican members of Congress, Laura has never caused a single drop of blood to spill, a dollar of property damage to take place. Even Moses was more violent than she is; after all, he did kill that overly eager Egyptian overseer. David was denied the building of the First Temple because he waged constant wars against his enemies. Laura like Gandhi does one thing, the hardest thing of all: she simply walks up to the oppressors and the haters and the powerful and tells them to their faces that they are full of it. That their pronouncements are lies, that their power is fake, that they love no one bu themselves and their power and their big mansions, that they are in fact pathetic leeches who drink the blood of the American People. That’s all she does. Now YOU try it.